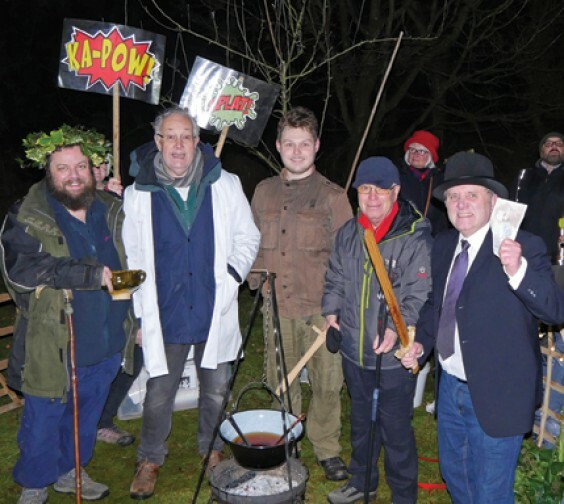 The annual Lickey Community Orchard Wassail, held by The Lickey Hills Society and the Lickey Hills Country Park Rangers, saw more than 180 people enjoy the fun – starting in the Visitor Centre where Step on Board strutted their stuff to the music of Bob Bignell and his merry band. 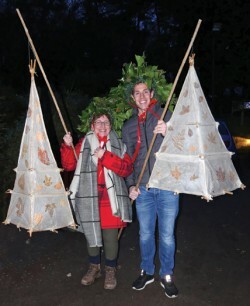 Having chosen Rosemary Elvis as Queen Pea and Adam Holloway as King Bean (right), the procession made its way to the orchard, led by Head Ranger Steve Hinton and making as much noise as possible to ward off evil spirits and ensure a bountiful harvest. There was singing, mulled apple juice and an impromptu poem by special guest Spoz, written in 30 minutes! The Mummers Play (above) enthralled the audience with a topical storyline, a handsome Robin Hood, a fearless doctor and Harry Cannab carrying the villain off to hell.